The transformation from one shot to another is created through the use of a ‘Match Cut’, in which ‘one object matches the placement of a subsequent object and/or matches its shape. Or there is some symbolic connection between shots’ (Moving Image 1: Setting the Scene, 2017:93). 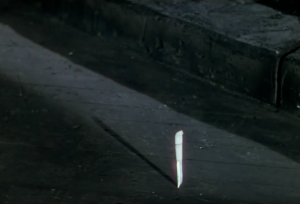 In ‘The Red Shoes’, the ballet dancer is given a knife to the cut dancing shoes off her feet. As she starts cutting, the knife transforms into a leafy twig. The dancer throws the twig down and it turns back into a knife, which sticks in the floor boards. This visual transformation works through three shots, starting with the dancer dropping the twig. This cuts to a static shot, in which the twig falls from the top edge of the frame towards the floor. On reaching the middle of the frame, the twig transforms back into the knife, now stuck in the same floor. Stanley Kubrik uses a similar approach in the opening sequence of ‘2001: A Space Odyssey’, in which a visual transformation is set up using three shots. 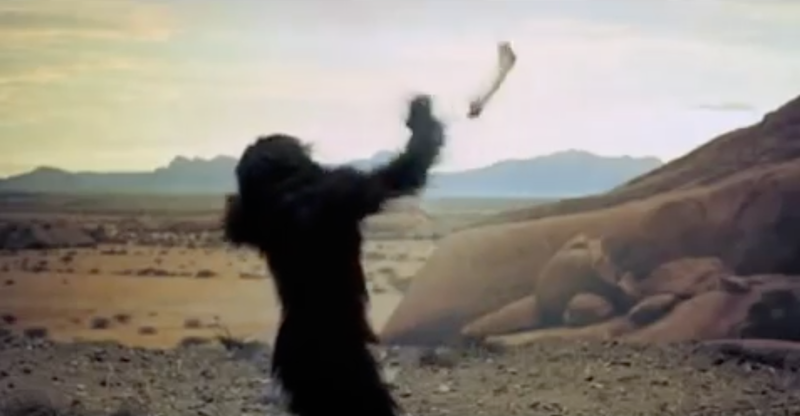 Here, an ape is seen throwing a bone in the air. This is followed by a shot of the bone spinning in slow motion in the air. 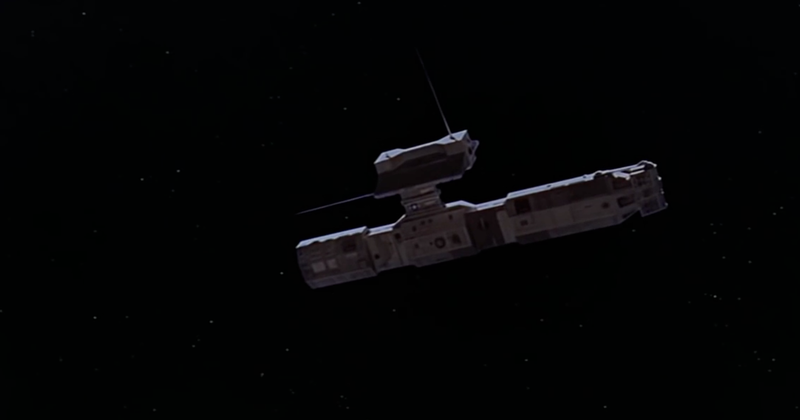 There is then a match cut to a space ship floating above the earth. 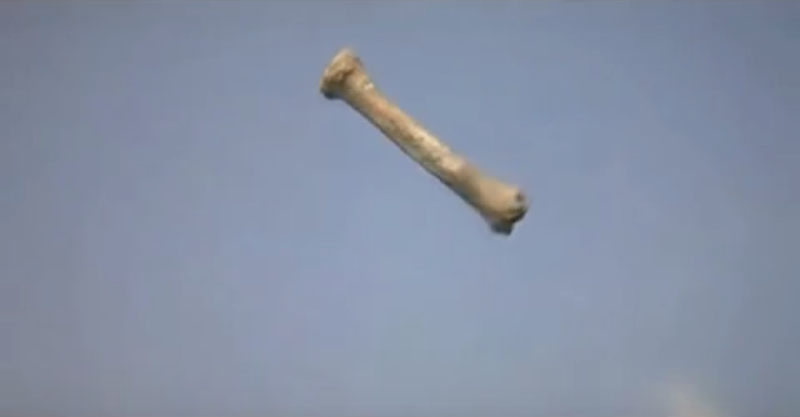 The result is both a visual connection between the spinning bone and floating spaceship, and a conceptual connection between the pre-historic form of ‘tool’ and the 21st century form of ‘tool’. The result is an image sequence built around a critique on the purpose of tools and machines. David Lean adopts a different approach to presenting the passage of time through visual transformation in ‘Lawrence of Arabia’. This time, using only two shots, first a shot of Lawrence holding up and blowing out a lighted match, and then a shot of the desert at sunrise, the juxtaposition of images creates a symbolic connection between the heat of the match and the heat of the sun. I like the way in which a small light source, the match, is replaced with another much larger light source, the sun. What these examples show is that as well as providing a way of changing time and location within a film, visual transformation can also add considerable weight to a film’s style and meaning. Before attempting to film my own ‘transformation’ sequence, I tested out a few ideas on paper to see how well the placement of objects within frame and the visual and symbolic connections between shots worked. In the first scenario, ‘Candlelight’, I took the idea suggested in the project brief and modified it to show a character reading a manuscript removing their glasses and folding the frame together. The shot of the folded glasses transforms into a burning candle. The transformation here is used to show a change of time and place, from present day to an earlier historic period (e.g. 17th, 18th or 19th century) in which another character is reading by candlelight. 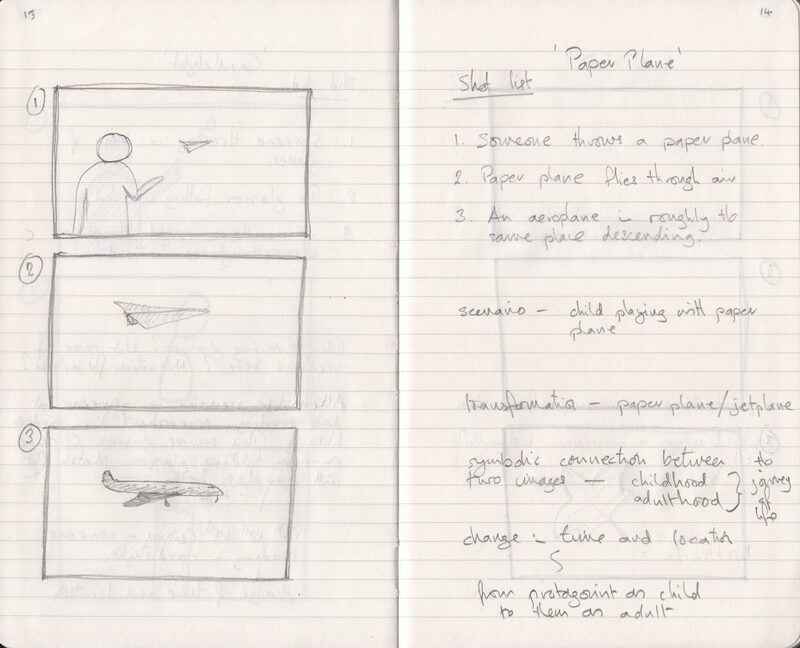 The second scenario, ‘Paper plane’, shows a child throwing a paper plane into the air and watching it fly. The second shot of the paper plane flying in the air is then match cut with an passenger jet on its final approach into an airport. Here the transformation is again used to show a change in place and time, except this time there is also a symbolic connection between childhood and adulthood, suggesting the journey of life. 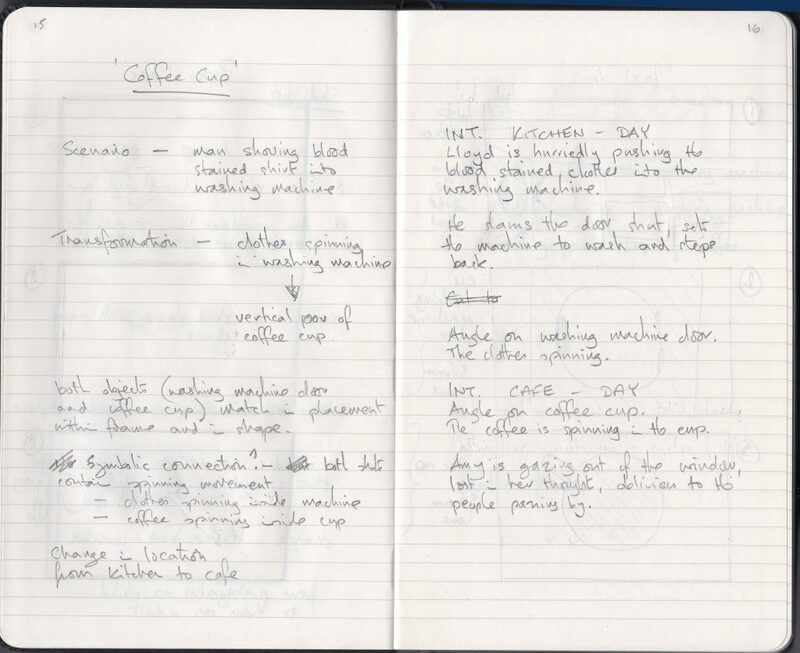 I then created a third scenario, ‘Coffee cup’, which used the match cut to move the action from one location to another. I liked the idea of creating a transformation from one shot to another with a match cut in which one object matched the placement of a subsequent object and matches its shape. I decided to do this by filling the frame with matching circles. 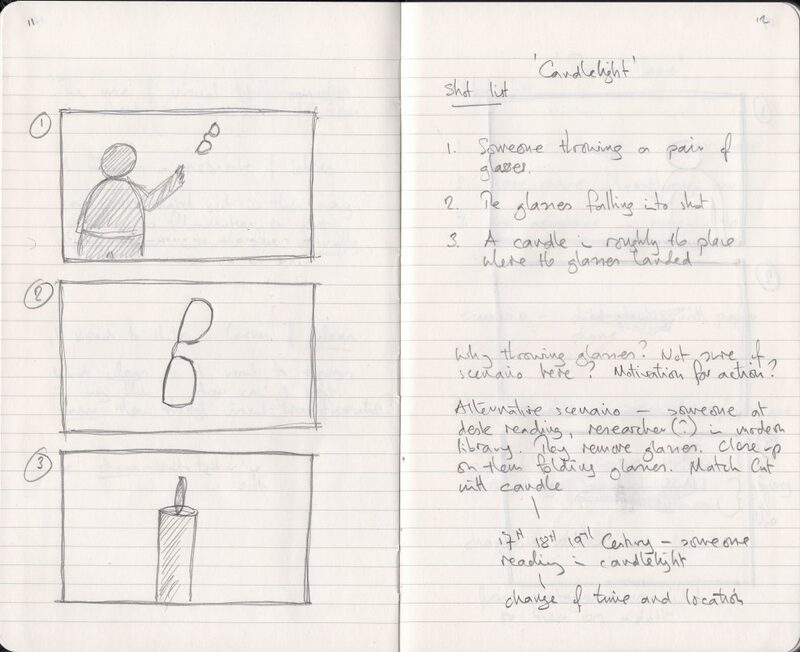 I began by writing a script for this scenario and sketching out a storyboard using three shots. 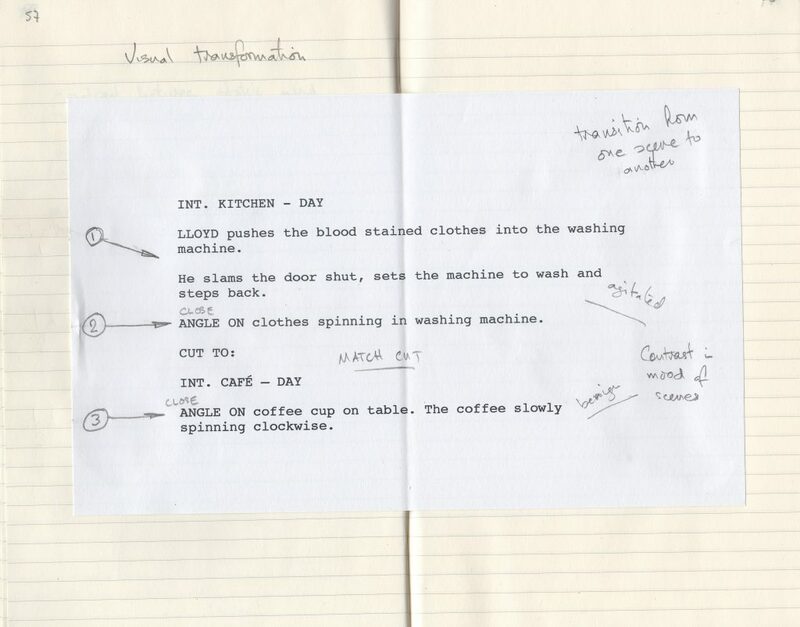 The idea behind the visual transformation in this sequence was to use the match cut to indicate a change in time and location, from a kitchen interior to a cafe interior, and to move from one character to another – from a man, agitated, putting clothes into a washing machine, to a woman sitting thoughtfully drinking coffee in a cafe. 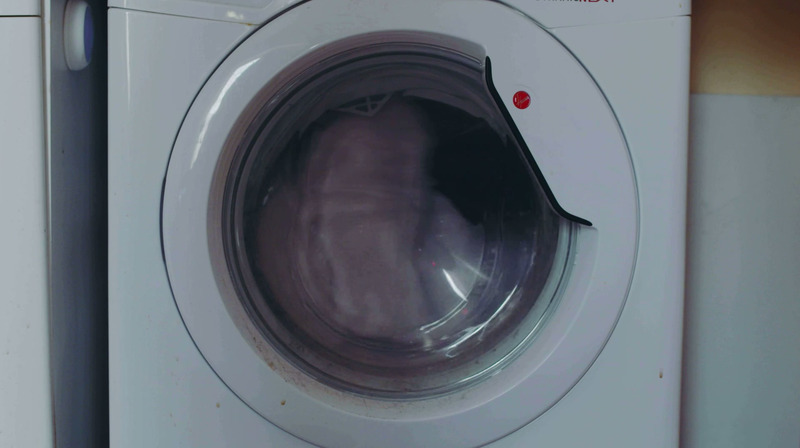 In the first shot we see a man pushing some clothes into a washing machine and slamming the door shut. The second shot is a close up on the machine machine door, through which we can see the clothes spinning. 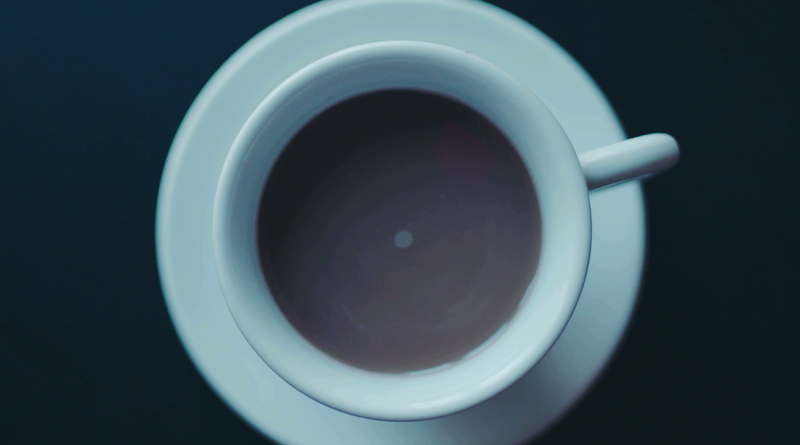 This is followed by a third shot composed of close up of a coffee cup seen from above. It’s contents are also spinning, echoing the movement within the previous shot, though much slower and more benign than the washing machine movement. 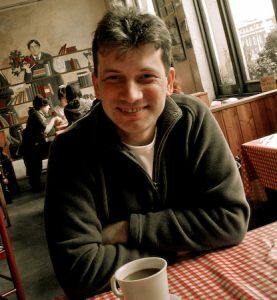 I like the idea that a film is a network of ideas and that these ideas can be embedded within a narrative through techniques such as visual transformation. 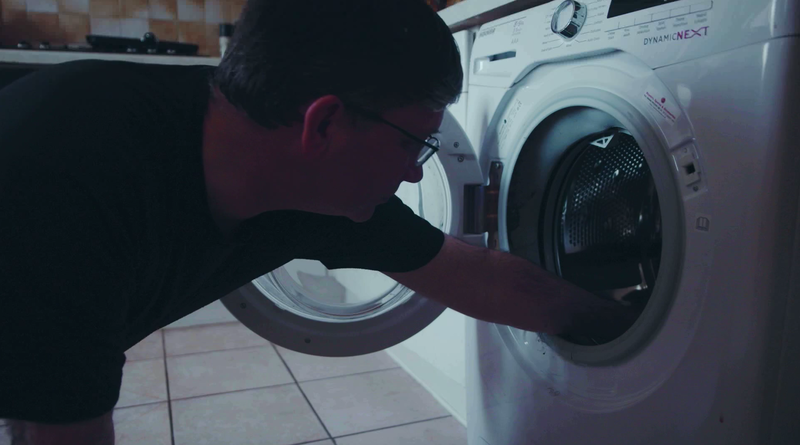 In this project film, I set out to create a sequence that uses the match cut in a similar way to that used by David Lean in Lawrence of Arabia, to create a symbolic connection between two juxtaposed images – the clockwise movement of the clothes in the washing machine and the clockwise movement of the coffee in the cup. 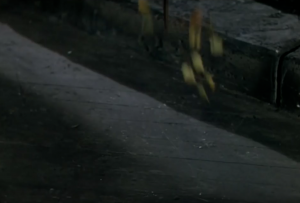 Within the context of their respective scenes, the spinning movement carries a different meaning for the two characters. For the man in the kitchen it is agitation and panic. For the woman in the cafe it is calm. Visual transformation clearly has the potential of being a very powerful tool within a moving image and is now something which I will be alert to when planning shots for my moving images. Using match cuts enables the filmmaker to embed their ideas visually within a film. 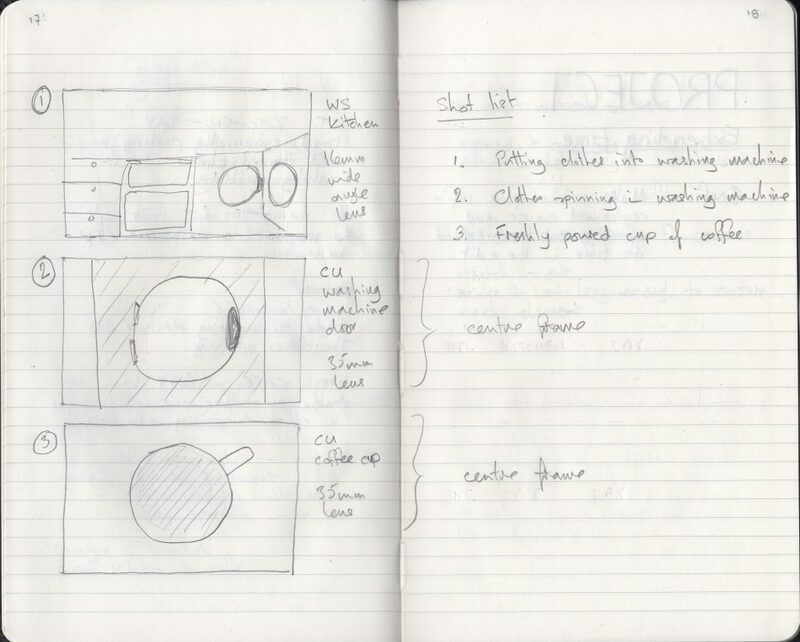 When planning moving images I need to think in terms of ideas. I need to ask myself: What ideas do I want to express in my film? How can I best show these ideas through visual transformation? Moving Image 1: Setting the Scene (2017). Barnsley: Open College of the Arts.